I feel stressed out today. Having problems with my programming project at work. Um..... What can I say? It's just part of life, right? :-) I have to look ahead. When all things are over, I will feel much better. I want to share a picture that was sent to me from the Myanmar Institute of Theology. The picture was a group of MIT's guests participating at the Doing Theology under the Bo Tree program. Doing Theology Under the Bo Tree, a program that is open to seminary and university students, Christian ministers and lay people, was inaugurated in 2000. 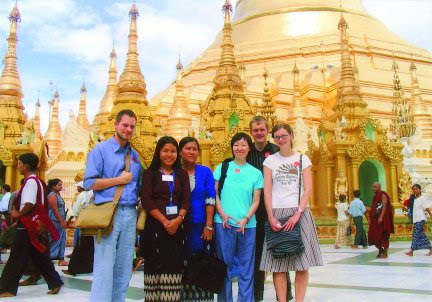 This program includes opportunities for a week-long study trip to Mandalay, Bagan and Inlay Lake in upper Myanmar, and to Mawlamyine and Pa-an, Basein, in lower Myanmar. Visits to Buddhist homes for fellowship with the Buddhist families, and to some historic sites in Yangon city such as Shwedagon Pagoda, Kaba-Aye Pagoda, The International Theravada Buddhist Missionary University and Buddhist meditation centers for study and research purposes are part of this program.